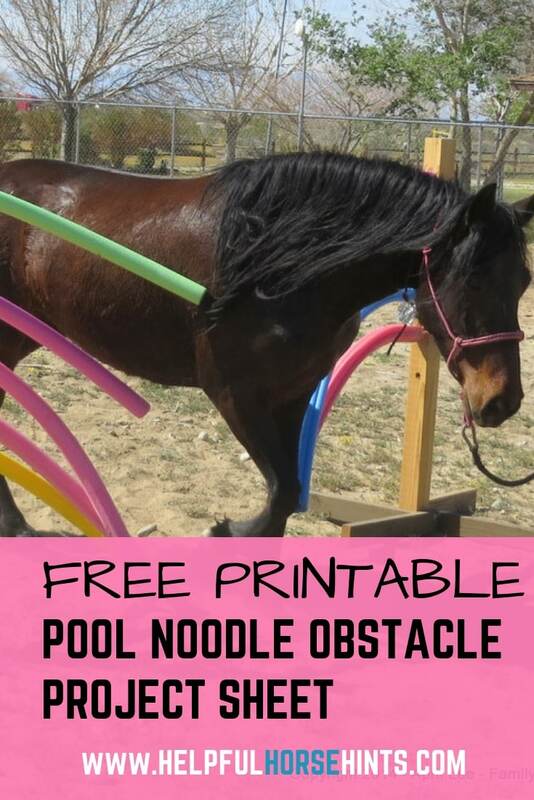 Pool noodle horse obstacles are great for desensitizing horses to having their body and legs touched. 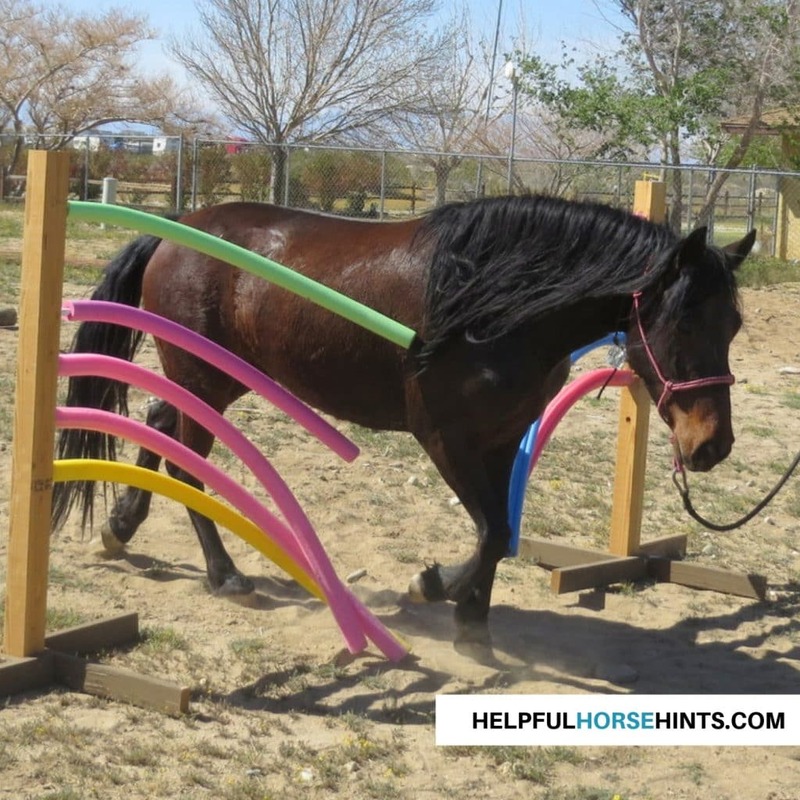 The great thing about this obstacle is it can be used for any age horse. Start off on the ground and progress to navigating the obstacle under saddle. During summer months, pool noodles are regularly available at most big-box type stores like Walmart, Home Depot and Target. A lot of the dollar discount stores will also carry them. During the winter, or just anytime you are having trouble finding them, Amazon actually has a pretty good deal. Better yet, they are available on Prime if you have that service (which I love). If you don’t have Prime, you can sign up for a 30-day Free Trial. 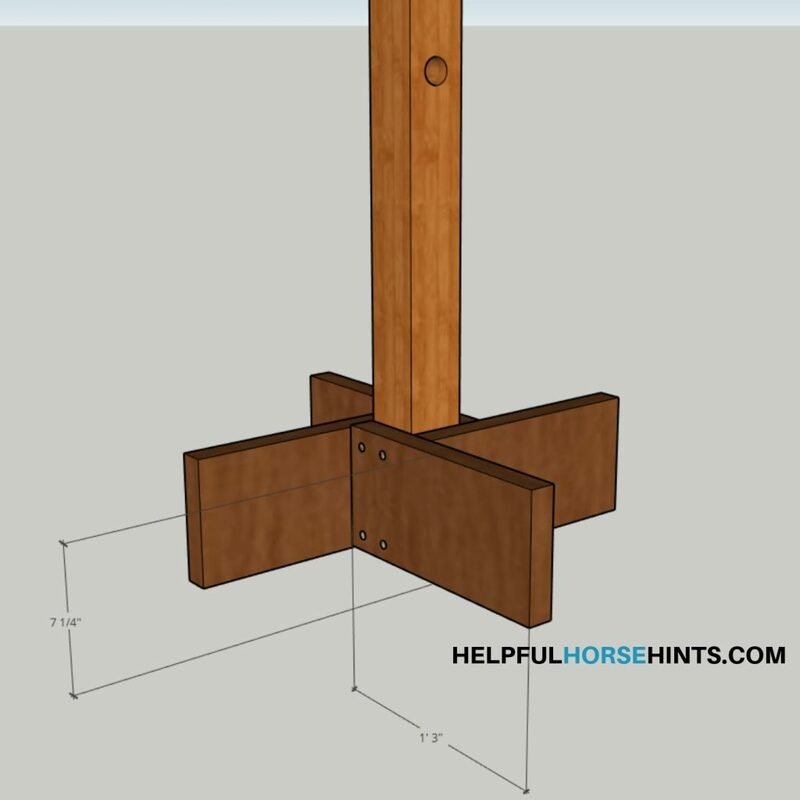 (1) 4x4x10 – To make a 5′ tall stand you can use a 10′ piece and cut it in half. Pool Noodles (Amazon has a set of 35 for usually under $2.00 each)..It’s off season now but you can get them from Amazon at the link below. We’ll use 10 here and have other obstacles coming up where we will use the rest! Take a pool noodle with you to the store to buy your pipe. The internal diameter of the holes can vary between pool noodle manufacturers. You want the pool noodle to fit pretty snugly on the pipe so it doesn’t come off as you use the obstacle. Step 1. Cut all pieces. Cut 4×4 into half. Cut 2×8 into 8 pieces. Most home improvement stores will cut long pieces of lumber for you right in the store for free. Just ask! That way if you don’t have a truck you aren’t trying to cart around a big piece of lumber. The bases for these stands don’t have to be 2×8. If you have 2×4 or 2×6 laying around that would work too. 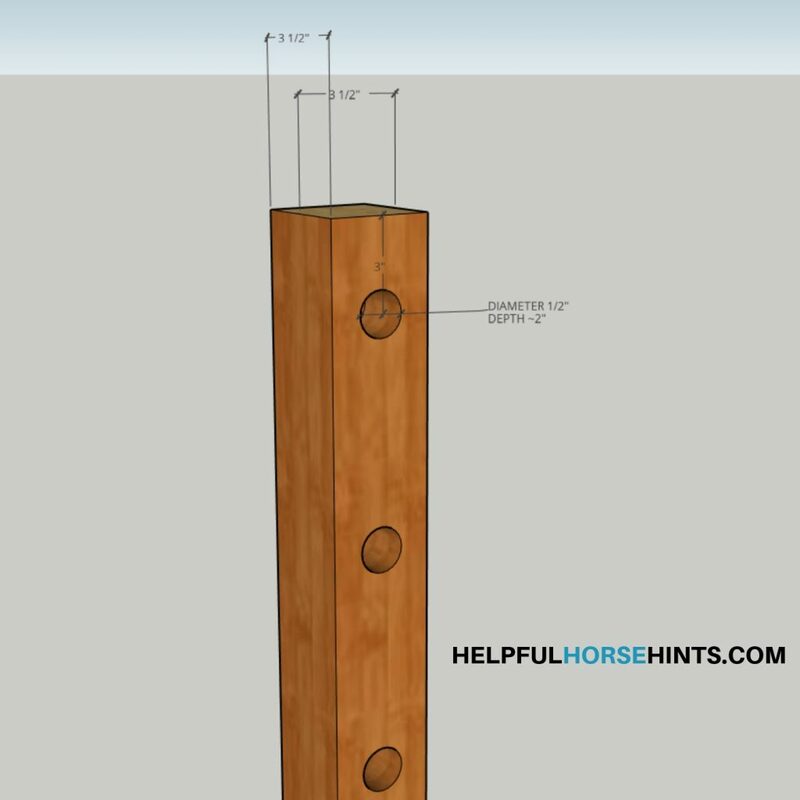 Really, you could fashion the supports out of any spare lumber lying around. 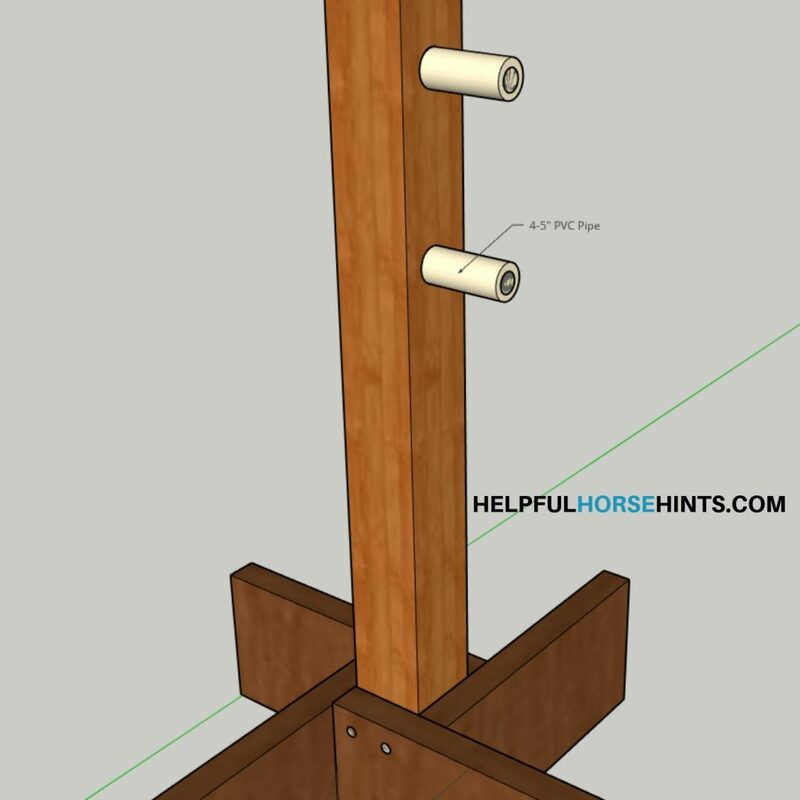 You may need to play with length / design to make it stable. Use what you have! Using your paddle bit. Drill as many holes as you need. 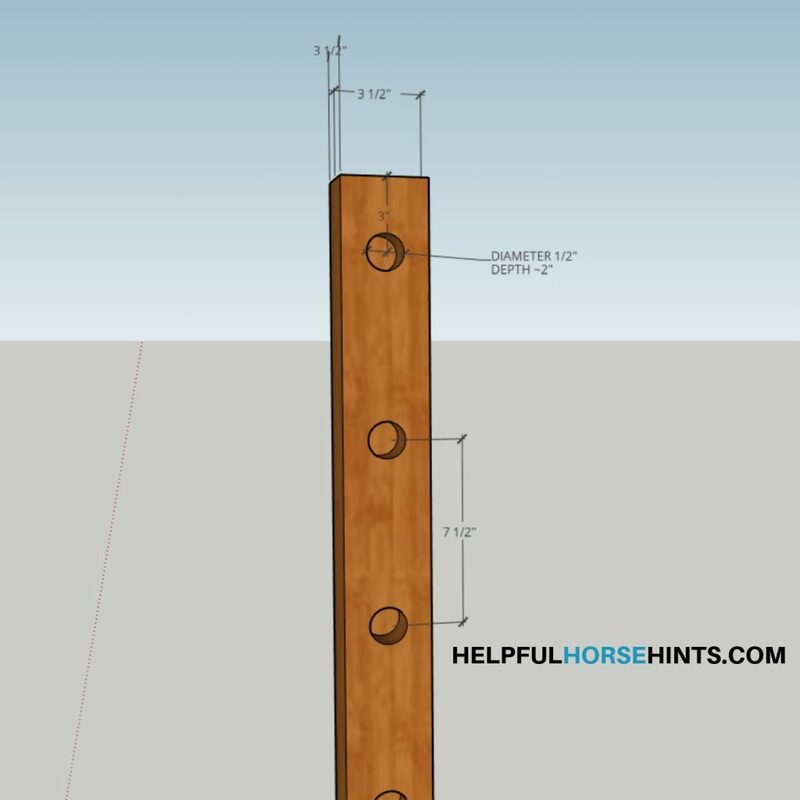 This diagram shows five holes per stand but you could add more if you want. Lay the 4×4 side by side to ensure holes are drilled evenly. 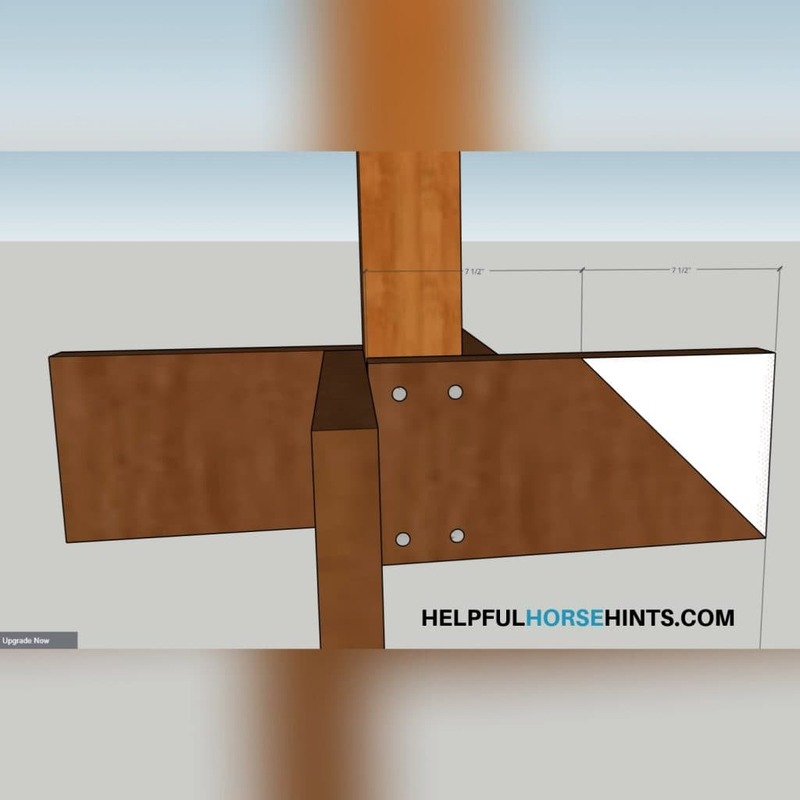 For this step, you should have four even pieces for each base. Use wood screws (I recommend 3″ or 3.5″ Deck Screws) to secure the base to the 4×4. Note: This pool noodle obstacle has 2×4 for the base. You can absolutely use what you have to save on cost! Because the 2×8 are a little high, here is an alternate idea for the base. Find the midpoint of your piece (in this case 7.5 Inches) and cut a triangle out of each piece. This still leaves you with the wide base at the bottom but lowers the profile towards the top. 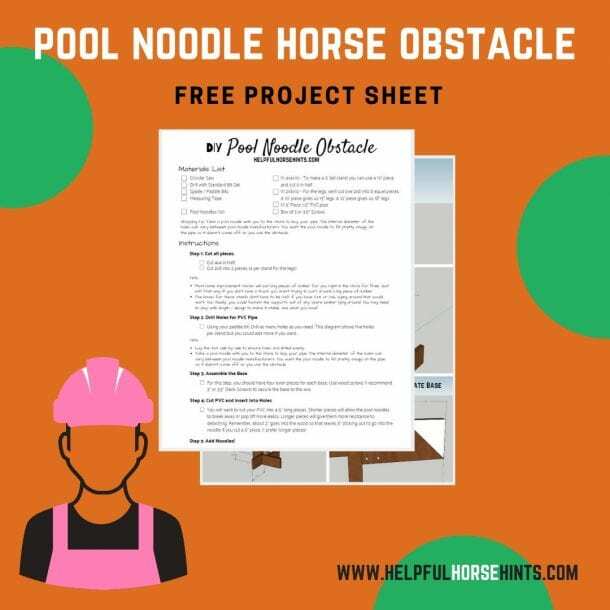 Download the FREE 2-page .PDF printable project sheet You will also be signed up for our newsletter which goes out 1x per week! Success! 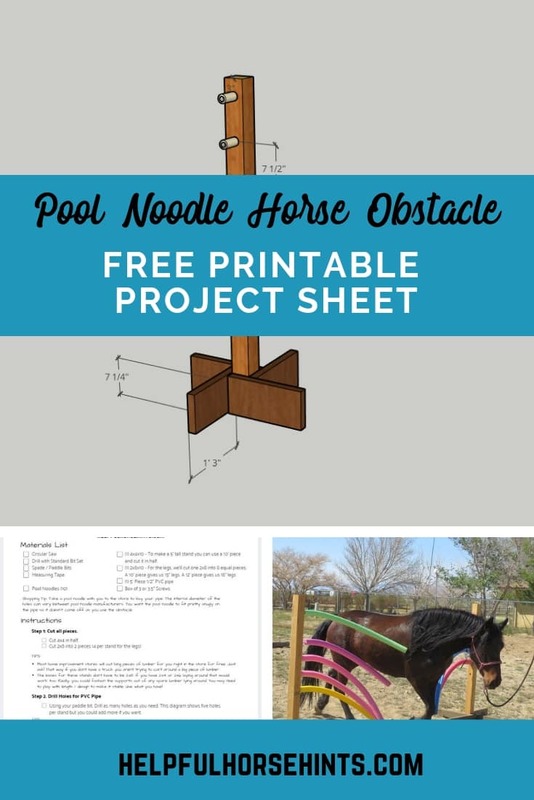 Check your email for the project sheet! This is awesome! I wish I had my own property and storage space to make this! 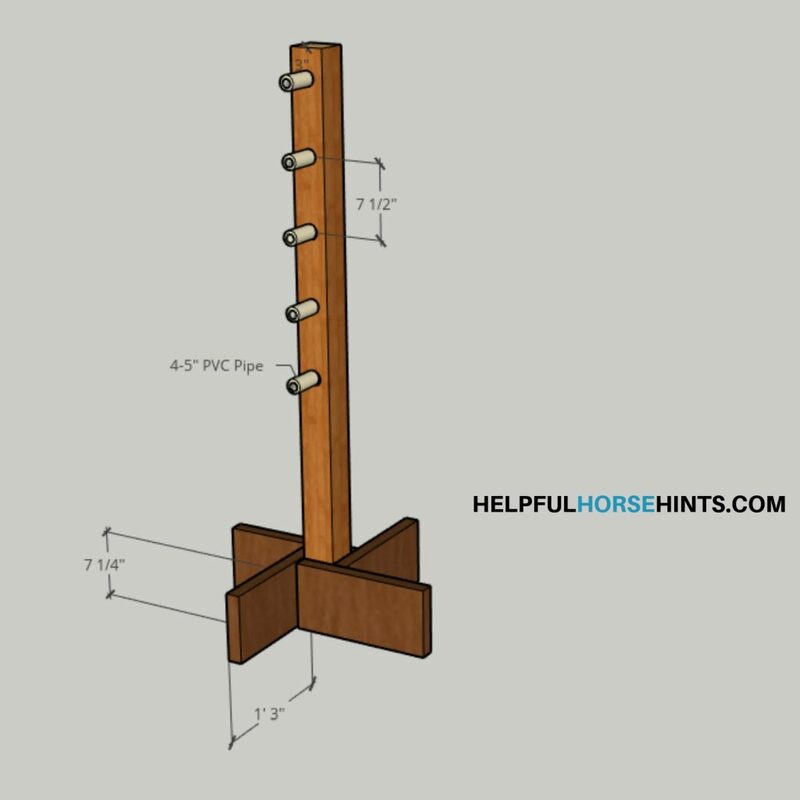 What a great training tool for horses of all ages!